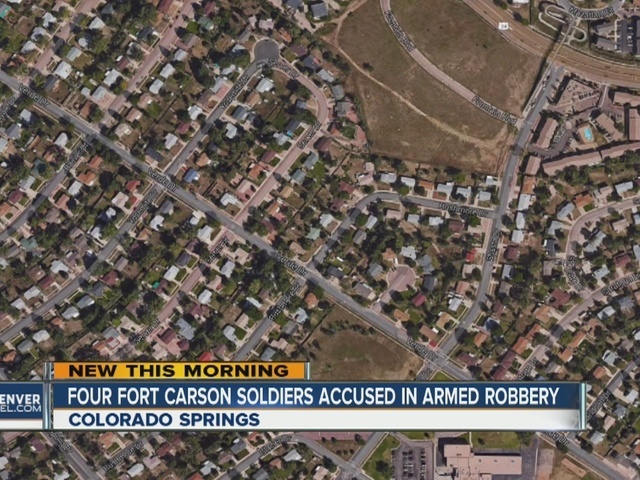 COLORADO SPRINGS, Colo. -- The El Paso County Sheriff's Office has identified the four Fort Carson soldiers who are accused in a home invasion in Colorado Springs. The sheriff's office identified them as Roman Alred, Mykal Hall, Dustin Mincy and Aaron Perry, Monday afternoon. Colorado Springs Police said there was a disturbance involving the four men, one of whom was armed with a gun, at 6:30 p.m. Sunday in the 1100-block of Verde Drive in Colorado Springs. "The suspect with the gun threatened to shot [sic] the family and was demanding property from the victims," Colorado Springs police said. "After the victims refused to provide the property the suspects left, and threatened to return." Instead, police said, the suspects turned themselves in at around 11:30 p.m. Sunday. Investigators have not yet identified which suspect was armed with the gun as of late Monday afternoon. The four were arrested on suspicion of burglary, felony menacing and child abuse, police said. The family of four, including two small children, were not injured, police said.